My mom made banana bread a lot when I was a kid. I loved when I came home from school to that familiar smell of fresh banana bread baking the oven. I couldn’t wait to have a warm slice topped with butter and watch it melt into the bread. Now when I bake banana bread, I’m reminded of my childhood and my mom’s baking. I buy bananas almost every week and they are usually eaten up by my next shopping trip. If not, I’ll save them and make banana bread. My kids love banana bread with chocolate chips. I haven’t even touched the tip of the iceberg with the amount of variations you can find for banana bread recipes. Check out the list of 22 must-try banana bread recipes listed below! I’ll never run out of ways to make banana bread with this list! Sure, I love my mom’s classic recipe, but sometimes I like to shake things up just a bit. I’ve experimented with different flavours and came up with my own banana bread variation – White Chocolate Cherry Banana Bread. I think I’ll pull my bananas out of the freezer and give one of these recipes a whirl. The important question is – which one to make first? Which one would you make first? yum pinned all the ones with coconut, I love coconut and they sound delicious! Thank you for catching that! I’ve updated the post to include the right link. I absolutely love banana bread. I literally want to try them all! I make banana bread all the time, seems I don’t eat the bananas quick enough. 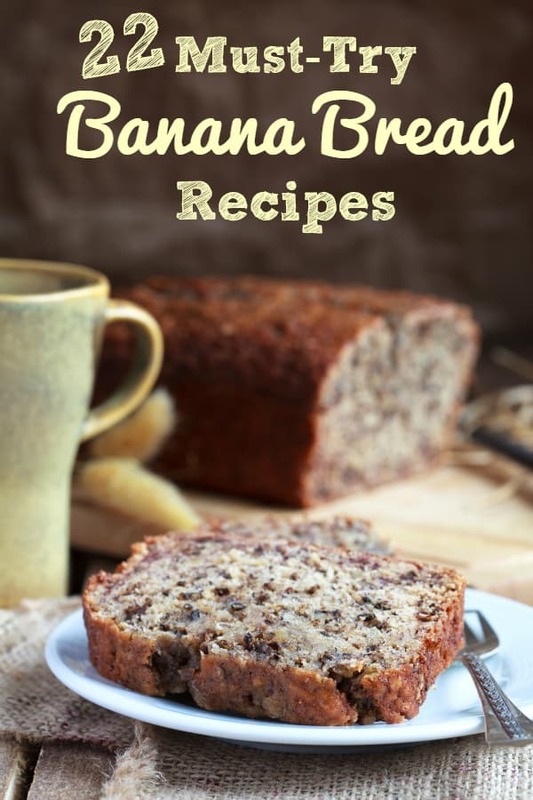 No matter I love banana bread and would love to try most of the recipes listed here. I love banana bread. It will be nice to try all of these different variations. Thanks for sharing. I love banana bread. What a great variety to try!